There is something about Erskine College that gets everyone going. It’s gothic, it’s iconic, and it certainly looks haunted, but the architecture and the site stir everyone’s imagination. PJ used it for one of his first big films The Frighteners, and for years it was the home of the Learning Connexxion where you could go for classes in painting, sculpture, and probably rhythmic interpretive dance. 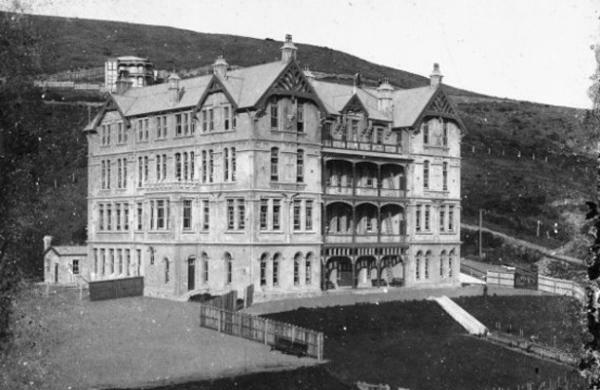 While derelict Catholic institutions around the world are generally getting torn down to purge the memories of inevitable child malpractice, Erskine seems to be one of the few where people have mainly good memories, and the Erskine Chapel was for several years Wellingtonians favourite place to get married. So it is with considerable interest that the latest proposals for the redevelopment of Erskine are unveiled. In typical stupid fashion the Dom Post doesn’t say who the architect is, so the public has no idea whether we can expect quality redevelopment or a quick slap up job, but with the developer being the Wellington Company, we know that we can expect innovative challenges. Ian Cassells is a funny bugger – famously described by Tommy Honey as being responsible for the tanalisation of Cuba St after Melling Morse used H3 treated pine everywhere on all the work they did to Cassells’ buildings there. After several years of sunshine, the green has faded away and the rough-sawn timber work remains. 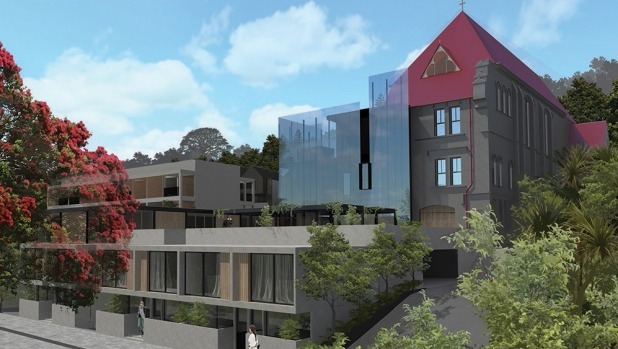 On the other hand, Cassells’ work on the DoC building was nothing less than visionary – taking the capital’s worst building (a lot of competition there I know…) and transforming it into one of Wellington’s best new green offices. Its just a shame that the strengthening wasn’t done to a better standard when the building was rebuilt, as, bizarrely, the building requires further strengthening now, just a decade after completion. Perhaps I’ve missed something here, but that’s not a good sign. Still. Onward! Erskine? What are we to make of this? 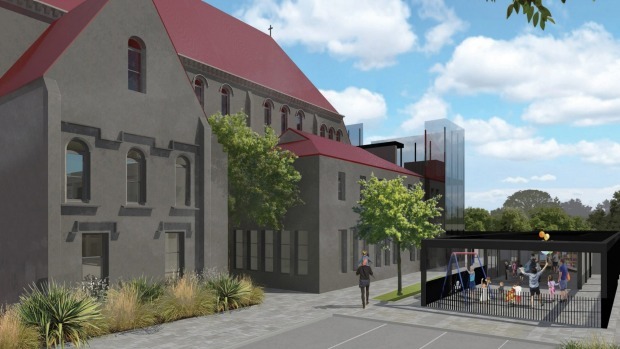 The architect’s drawing is so thin and sketchy and vague that we can’t really make out much at all, but I certainly wouldn’t call it co-ordinated with the last and lonely remnant of the College to be retained: the Chapel. The College building itself appears to have been completely demolished – and horizontal slots of apartments, 94 of them in total, have been proposed in its place. Gothic is notoriously a vertical thing – so to my mind these apartments look horribly out of place. The architecture is not at all in keeping with either the existing College buildings (which is demolished, and so arguably doesn’t matter any more) nor with the Chapel (which is retained). The iconic, gothic, spooky front wall that gives Erskine its character, is no more. Instead, a glass wall, of which I can’t for the life of me figure out what the point of it is, sails on up into the air, and wilfully clashes with everything else. A children’s play centre is proposed for the top, so the little ones can frolic in the Island Bay sunshine, but apparently there are already 2 facilities for kids nearby so I’m not entirely sure of the point of it. The question is: is it better to grasp this, the last chance Erskine has of survival (Chapel only), or should Wellington just say “to hell with it” and condemn the whole sad sorry mess to the Catholic afterworld for perpetuity? Interesting that, of the whole complex, the chapel has been deemed significant. To me it is a rather ugly exercise in reinforced concrete from the outside, and on the inside, rather squat and dumpy for a ‘gothic’ interior. It must have been passe even when first built in the 1930s? How much do you suppose the body corporate levy for cleaning the curtain wall will be? Starkive – alternatively, how likely do you think it will be that the glass wall will actually be built? I think I’ll go out on a limb and predict that the glass wall won’t make it through the design process….